As we grow old many of our movements can become very stiff and limited. And if we are not careful enough to take good care of our body we are going to have a very hard time later to do some of the simple stuff, like brushing. That is why it is so important to eat well and exercise both body and mind so when we are a little old we can feel and move like in our 20’s. If you are elderly or want to take care of your loved ones, keep reading. These tips for helping the elderly to take care of their teeth correctly can also apply if they have dental implants, crowns or dentures. You can take care of these the same way we clean natural teeth. The most important thing in this is to have a consistent dental care routine that will help us get rid of bacteria and avoid that can affect our oral health. This is important especially for elders who are more fragile than most people. Many elders have like a thing when it comes to new technologies and such. They often feel intimidated to use some of the tools that they are not used to see or use. But in this case, these new tools can help them a ton to clean their teeth efficiently. And more easily too, one of the best items an older person can have in their bathroom is an electric toothbrush. The electric toothbrush allows elderly people to effortlessly clean their teeth. They can cost a little bit but if you are willing to make the investment you are not going to regret it certainly. And one of the strongest points of the electric toothbrush is that is so easy to use that you are not going to want to use a traditional toothbrush never again. I got one for my grandma at mothers’ day and she loves it. Just remember to complete your dental care routine with dental floss and mouth wash. As I stated above, it does not matter if you have dentures or implants, it is very important that you take good care of these if you want them to last for many years. Just by using dental floss and a good mouth wash you will avoid nasty diseases like cavities and gingivitis. Take into account that even if you have some kind of teeth replacement you can still builds up plaque. So having a good dental care routine is a must to preserve them in top notch condition. 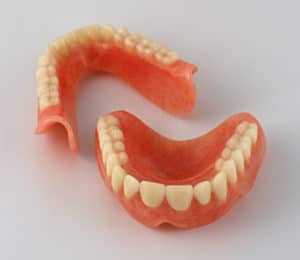 Other nice thing elder people can do to take care of their teeth is to eat well. A nice diet will give them enough nutrients to keep their natural teeth and help their gums to stay strong and healthy. Eating citrus fruits like lemons and oranges can get your body the vitamin it needs to stay healthy and boost your teeth defenses. As for natural teeth it is also good to ingest apples and pears because it helps to clean the teeth naturally. Those fruits are perfect for a sweet treat and avoiding ingesting too much sugar which is terrible for old people. Aside from this you should avoid tobacco and alcohol at all cost because they are really rough on elderly teeth and you should keep visiting your dentist at least twice a year to keep everything neat. And if you are interested in cheap teeth replacement visit us in Dental Solutions Los Algodones for some nice prices in dentures implants and crowns. Our specialty is the all on 4 treatment which is a cheap alternative to have a new set of teeth for crazy low prices!